The Intel HD Graphics 4200 (GT2) is a processor graphics card that is included in some of the ULV Haswell processors of 2013 (4th generation core). The relatively low base clock can be automatically overclocked using Turbo Boost technology. In comparison to the HD 4000, the graphics core has been modified in several details. The GPU supports DirectX 11.1, OpenCL 1.2 und OpenGL 4.0. It also features an improved decoder for 4K videos and the fast Quick Sync encoder. The performance of the HD Graphics 4200 is clearly below the HD 4600 and HD 4400, since the GPU is designed for ULV models of the Y-series (11.5 W). Therefore, the clock rates are relatively low. Compared to a similar clocked HD 4000, the HD 4200 is somewhat faster due to architectural improvements and an increased number of execution units: The GT2 version integrates 20 EUs, compared to 16 EUs for the old HD 4000. In simple games like Anno 2070 or Counter Strike: Global Offensive, the performance is sufficient to handle low settings and 1024 x 768 pixels. Many current titles like Battlefield 4, however, are not playable even at minimum graphic quality. Detailed benchmarks can be found below. Due to the 22nm 3D Tri-Gate production process, the power consumption is relatively low and suitable even for tablets. In addition to the TDP of 11.5 watts, the Y-series CPUs are rated at an SDP (average power consumption) of 4.5 or 6 watts (depending on the model). 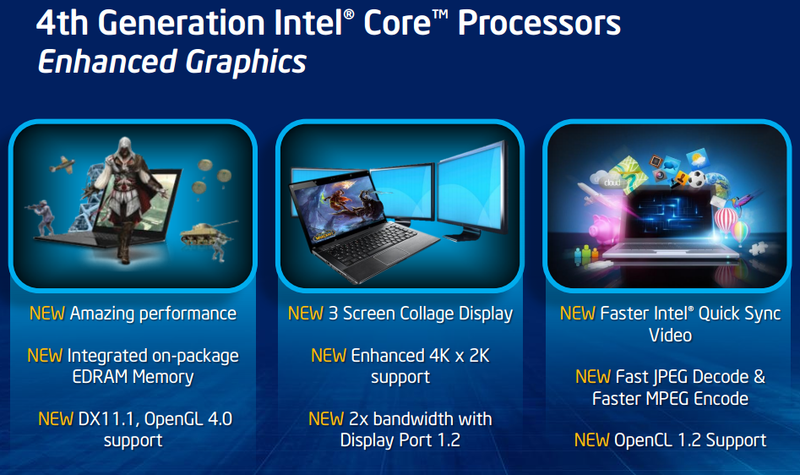 The Intel HD Graphics (Broadwell) (GT1) is an integrated Broadwell graphics card revealed in Q1 2015. It can be found in several low-end CPUs such as the Pentium 3805U or Celeron 3755U. The so-called GT1 GPU offers 12 EUs (Execution Units) and therefore somewhat more shader power than the previous HD Graphics (Haswell). The clock range may depend on the specific model it is built into. 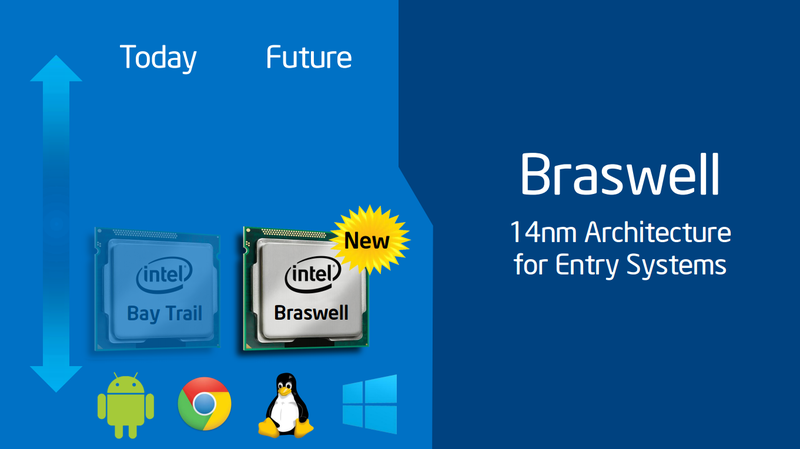 Broadwell features a GPU based on the Intel Gen8 architecture, which has been optimized in various aspects compared to the previous Gen7.5 (Haswell). 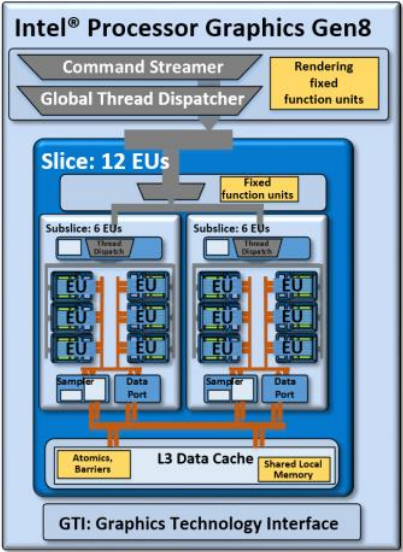 In case of the GT1 version, the shader arrays called "subslice" have been reorganized and now offer 6 Execution Units (EUs) each. Two subslices form a "slice" for a total of 12 EUs. Combined with other improvements such as larger L1 caches and an optimized frontend, the integrated GPU has become faster and more efficient than its predecessor. The HD Graphics (Broadwell) represents the low-end version of the Broadwell GPU family and consists of one slice with 12 EUs. Beyond that, there is also a mid-range variant (GT2, 24 EUs) as well as higher-end models (GT3/GT3e + eDRAM, 48 EUs). Even though the HD Graphics (Broadwell) is clocked a bit lower, the performance should be clearly above the HD Graphics (Haswell) and similar to the HD Graphics 4000. Nevertheless, only a few games as of 2014/2015 will run fluently at (very) low settings, e.g. Dota 2 or Sims 4. Utilizing a new 14 nm process, the HD Graphics (Broadwell) can be found in ULV models (15 W) as well as regular dual core CPUs (37 W, not yet presented). The TDP is flexible and can be further reduced, which has a significant impact on performance.